This is just an observation, something I have thought about many times over the years. Readers may agree with me, then again they may not. How many classes is too many? I have been involved in racing with both motorcycles and cars for many years and since this is a motorcycle web site I will address the issue from a motorcycle point of view. The old line about what you “ought to do” is unusually followed by some racer’s opinion of how you ought to have some “new class” for some obscure combination of machine that they just happen to have an exact duplicate of in their garage! Fact is, when a promoter lets themselves get talked into such a deal, nine times out of ten, “everybody” turns out to be the person you are talking to about the “new class”, and both of the other people on this planet that run whatever oddball machine that they happen to think is the greatest thing since sliced bread. Truth is over the years I have witnessed several promoters cost themselves plenty of money in such situations, just because they don’t know when to tell someone the word “no”. Run a class for Harley Sportsters? Good idea! Run a class for import sportbikes like 600’s or 750’s? Good plan! Run a class for British parallel twins with two stage nitrous, street tires, and no wheelie bars? Dumb idea. Think about it. From a promoter’s point of view, what is better to have? Maybe eight or ten good, solid classes with lots of entries in each at a race? Or fifteen or sixteen classes, some of which are money losers, of which maybe four or five of the classes only have four, five, or six entries a race? The answer is so obvious that Ray Charles in his current condition can see the answer! You will never make money by running a class with four, five, or six entries. Eight or ten good strong classes with lots of entries in each is the way to go. To me any class that cannot draw at least fifteen or sixteen entries is not worth having. Racing promoters are in business to make money, if they are not, they are foolish. Promoting races is a business and should be run as such. Show me a racing organization that does not make a profit, and I will show you one that will not be around in a year or two. It seems to me that some organizations now days would be well advised to combine some of the classes they run that receive little racer support, with classes they already have that run very similar machines with sometimes as minor a change as adding wheelie bars, racing tires, or running different fuel. Unless an organization has funding from some sponsor with deep pockets to keep some obscure class going that only draws half a dozen entries, why run it? Now if some sponsor wants to pay for it to entertain themselves fine. There are some of those out there, sponsors like that are far and few between though. MIROCK’s Heavy Hitter’s class, designed for no-wheelie-bar sportbike riders weighing over 220 pounds, was eventually merged with Pro Sportbike because of lack of entries. Today in the United States, motorcycling on the street is more popular than ever. 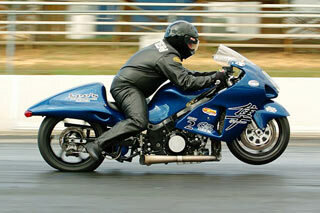 There is no reason that motorcycle drag racing should not be more popular than ever. 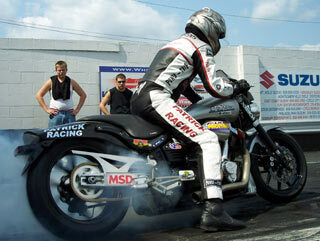 It is up to the promoters of different motorcycle drag racing series, and race track promoters to make the right decisions to make a profit from motorcycle drag racing. Sometimes “the right decision” includes telling someone the word “no”.